Edition 02 :22 July, 2013. Summaries of monetary reform papers by L.F. Manning published at http://www.integrateddevelopment.org. Comments on the (Jaromir Benes and Michael Kumhof) Chicago Plan Revisited Paper. Manning plan for permanent debt reduction in the national economy. There’s no such thing as affordable housing. MEASURING NOTHING ON THE ROAD TO NOWHERE: THE MYTHS OF INFLATION AND GROWTH MEASUREMENT. This paper shows conclusively that the existing world economic order is approaching a state of structural collapse as the sum of accumulated systemic inflation (Ms in the paper) plus the bank residual (R in the paper) approaches nominal GDP leading to debt default and the destruction of GDP. Paper released 9th July 2013. More people working efficiently for more hours increase productive output. The same people working more efficiently for the same number of hours increase their productivity. Both are forms of economic growth. Orthodox economics generally discounts real productivity gains and fails to effectively measure economic growth. By using the basic accounting equation and the debt model described in the paper, economic “growth” can be better managed without creating the boom and bust cycles that are typical of orthodox approaches to money supply. The paper suggests there are few measured productivity gains in the debt-based financial system. All “price” is inflation and most nominal GDP increases now represent systemic inflation. The paper also shows how productive sector consumer price (CPI) inflation is misrepresented in key economic data. CPI inflation measured as an increase in consumer prices over time cannot simply be subtracted from the nominal increase in the value of Gross Domestic Product (GDP) to provide an economic “growth” figure because the average percentage “value” of inflationary increases in GDP is only half the percentage CPI price rise. Since the US$ gold peg was removed by President Nixon in August 1971, there have been just two main methods employed to manage inflation, the “monetarist” money-growth rule championed by Milton Friedman and the “inflation targeting” approach based on the Taylor rule. The former seeks to constrain inflation by limiting the money supply while the latter essentially seeks to constrain the money supply by limiting inflation. Neither approach has worked because neither approach satisfies the basic accounting equation given in equations (1) and (2) discussed in this article, resulting in decades of poor economic outcomes and devastation for countless millions of people around the world. Recently, there has been a great deal of discussion about a monetary reform program called the Chicago Plan. The IMF has modelled that proposal in a working paper called “The Chicago Plan Revisited” (CPRII) ( see Jaromir Benes & Michael Kunhof, IMF working paper WP/12/202 final version 12th February, 2013). The proposal entails replacing existing interest-bearing bank debt with debt-free, interest-free money called Treasury Credit in an effort to stabilise the world’s monetary system. The CPRII modelling uses a Friedman nominal money growth rule formula (CPRII equation 31, and p.61 top) for the reformed monetary system. That controls inflation in the productive sector only if just the right amount of new money is allocated to the productive transaction accounts used to generate “optimal” economic output. As discussed below, setting money growth equal to a subjectively established growth rate of output is insufficient in a debt-based system, whether that debt is bank debt or secondary (Savings and Loan) debt. Benes and Kumhof also use a “conventional forecast based interest rate [Taylor] rule” (CPRII equation 20) to model the policy inflation rate (price stability) in the present system. That target inflation is also subjectively expressed in terms of the change in government debt and a “steady state nominal interest rate”. This paper suggests the Friedman money rule and Taylor rule approaches are quite different from each other and that neither works as it is meant to. 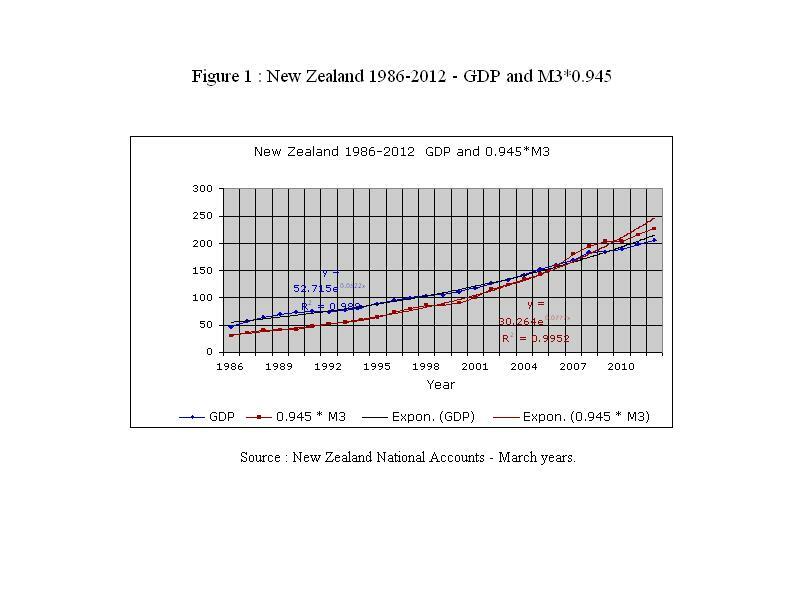 Figure 1 shows M3* 0.945 and GDP plotted against time for New Zealand. [For New Zealand, 0.945 *M3 is used for the non-productive money supply in the investment sector because the productive transaction account balances used to produce the GDP are estimated to be about 5.5% of GDP. GDP ($209b) and M3* 0.945 =$239b are close enough for the first global approximation shown in Figures 1 and 2. The transaction account balances have increased during the period 1986-2012 as their speed of circulation has declined, but those changes too are considered immaterial for the purposes of this article. 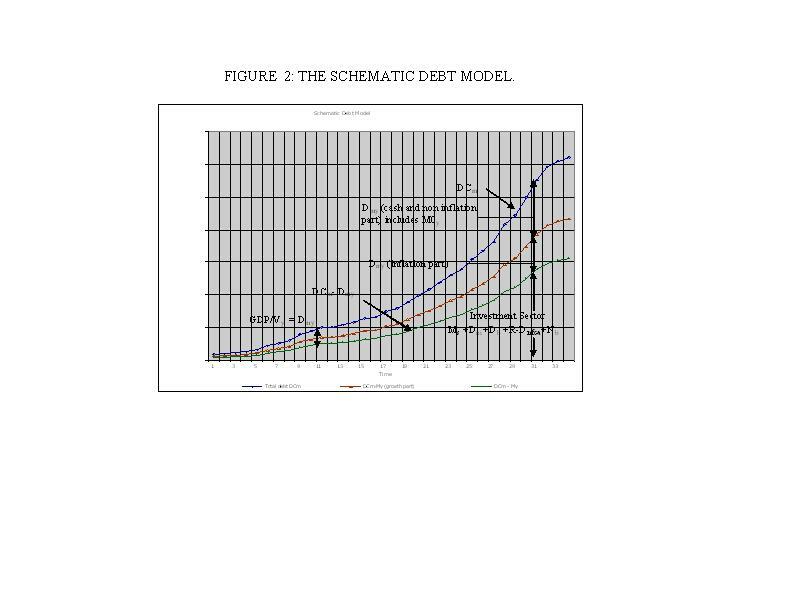 ]The trend-lines are exponential because the payment of deposit interest in the interest-bearing debt system creates systemic inflation as shown in Figure 3. The net additional flow of deposits from the current account deficit and capital transfers creates a different exponential rate of growth of the investment sector relative to GDP. That differential rate of growth has been about 0.7%/year over the period 1986-2012. Note that the exponentials in Figure 3 (5.2%, 7.8%) are different because the curves there have different starting points. If the data sets are set at the same starting point (52.7) the 0.945*M3 exponential is 5.9 showing that 0.945*M3 increased 0.7%/year faster than GDP from 1986-2012. The exponential curves are themselves subject to some change over time because of very long run changes in interest rates. Due mainly to the increase in New Zealand’s negative net foreign currency assets, the investment sector in New Zealand has grown at 5.9%/year while its nominal GDP has grown at 5.2%/year over the same period. That is partly why prices in the non-productive investment sector there are “overvalued” and why neither the Friedman rule nor the Taylor rule applies. The financial needs of the economy are not just about sticky wages and output gaps as orthodox economics claims. [“Sticky” is the term used in economics to describe resistance to downward pressure on variables like incomes and prices. For example, wages are “sticky” because it is very difficult in many countries to lower them once they have been increased.] They are also about monetary factors external to the productive economy. This paper clearly demonstrates that those monetary excesses and shortfalls can be quantified accurately. The author’s paper the DNA of the debt-based economy demonstrates that GDP equals the outstanding principal on productive capital investments (fixed capital formation). Were the growth of 0.945* M3 to exactly follow the growth of nominal GDP, the prices of existing assets in aggregate would closely mirror nominal GDP. The reasons why the Friedman and Taylor rules cannot apply, and the myths underpinning present inflation and growth measurement are now discussed. THE RELATIONSHIPS BETWEEN MACROECONOMICS AND THE BASIC ACCOUNTING EQUATION. Dollar references in this paper are to the New Zealand dollar (NZ$). It is impossible for deposits to be lower than the existing interest-bearing debt in the capitalist system after subtracting the country’s net foreign currency debt and the banks’ net worth that they have “captured” from the deposit base. Otherwise the basic accounting equation (1) below is not satisfied. The formula in equation (1) represents the basic accounting equation. The Residual is positive in the equation (1) format, while NFCA is negative for debtor countries. M3 = Deposit liabilities of M3 institutions plus those of the Reserve Bank ( in New Zealand, the RBNZ). Residual R = Aggregate retained bank profits + paid up capital. Treasury Credit = Debt-free, interest-free central bank credit. government and private productive capital investment]. Equation (1) is the basic accounting equation stated from the banks’ point of view. In New Zealand, while nominal GDP grew by $159.2 billion between 1985 and December 2012, 0.945* M3 grew by $196.3 billion, a difference of $37.1 billion. (Reference : New Zealand national accounts for GDP, Reserve Bank of New Zealand Table C3 for M3.) Some of that extra $37.1 billion represents surplus deposits over and above those needed to fund the principal outstanding on productive capital investments (fixed capital formation) in the capitalist system. The total surplus is actually more than $37.1 billion because the accumulated surplus from before 1985 needs to be added. The total is thought to be a little over $40 billion. The surplus deposits are in addition to what would be considered necessary for financial stability using the orthodox Friedman and Taylor “rules”. The investment sector of the New Zealand economy, like that of many other countries, may have been periodically over-funded, causing bubbles, while the productive economy has been starved of funds because wages and incomes have been suppressed in misconceived efforts to manage inflation as shown in Figure 3. The orthodox (Friedman and Taylor type) monetary policy rules fail because they consider only the productive economy whereas they have to satisfy the basic accounting equation (equation (1)) that also includes the non-productive investment sector, the accumulation of bank net worth and the external investment position. DCm = Domestic Credit plus secondary debt Nb borrowed through non-bank lending institutions (NBLI). (DC = DCm-Nb). GDP/Vy = The debt and cash used to create GDP (Dmy= Dmt+M0y). Vy = The speed of circulation of productive transaction accounts. Dmy = The productive transaction account balance used to generate GDP. Dmt = The portion of Dmy arising from bank debt. Dni = Debt supporting non-inflationary economic growth. M0y = The portion of Dmy contributing to the non-inflationary cash transactions M0y * Vy . (M0y * Vy is included in Dni). Ms = Accumulated systemic inflation arising from net after tax deposit interest paid on the total system debt DCm. Dnfca = Net foreign currency assets resulting from the current account and capital transfers from the rest of the world. Db = Bubble debt (debt in excess of the systemic debt requirements). R = Bank residual retained profits and paid up share capital not being part of the money supply M3. Nb = Secondary non-bank debt. Note that the original version of the equation has been updated because it erroneously incorporated the whole of the accumulated current account deficit in the model instead of NFCA as required by equation (1). NFCA = The net foreign currency assets of the M3 banking institutions and the central bank. DC = Domestic Credit = DCm - Nb. M3 = Deposit base of the M3 banking institutions. The formula represents the basic accounting equation, where DC is Domestic Credit plus secondary non-bank debt, M3 is the total bank deposits, NCFA is the Net Foreign Currency Assets of the banking system and Residual is the net worth of the banking system. The Residual is positive in the equation (1) format, and NFCA is negative for debtor countries. Figure 2 shows the main elements of the author’s debt model. Statistics are publicly available for all the variables in equations (4) and (5) except for Vy, Ms Dni and Db. Initially, empirical estimates have to be made in the calculation of Ms and Vy because the physical data for them is not yet directly available. There is no reason, however, why data for Ms and Vy cannot be physically collected. The model is validated by solving equation (4) or (5) for Dni and Db as shown in Figure 4 and Figure 6. Equations (4) and (5) require no other multipliers or assumptions. Since the productive investment account balance (My) used to generate GDP can be estimated by analysing physical cash flows in the productive economy, a straightforward application of equation (3) will produce the “bubble” debt Db as a residual once Dni has been estimated. A positive rate of change of Db indicates bubble formation in the economy while a negative rate of change means bubble decay. Dni can be calculated using equation (9). A key objective of macroeconomic policy settings is to ensure Db = 0, that is, that there is just enough debt growth to provide for the system costs (investment sector, plus productive sector inflation) and support the cash-based transactions and other non-inflationary increases in the economy. In the special case of no foreign debt and no bubble, GDP comprises systemic inflation Ms that incorporates new debt to fund inflation, plus new debt Dni to fund non-inflationary growth, plus the non-circulating bank residual R. When Dnfca and Db are non-zero, DC, GDP and the terms in equation (9) will vary because they are each dependent on the size of DC. The debt model enables the effects of price (P) and output (Q) which together form GDP to be studied in a way that orthodox economic seems to be unable to do. As discussed later on, orthodox economics is also mismeasuring productivity increases. V = speed of circulation of M.
Q = output of goods and services. Several important consequences follow from the revised Fisher equation model and from the equations referred to above. The points discussed below are not in order of priority. Accumulated Current account deficit plus capital transfers from abroad and the Net Foreign Currency Assets of the banking system (NFCA). The accumulated current account and direct capital transfers from the rest of the world play a key role in economic performance because the Net Foreign Currency Assets form part of the money supply M3. On the other hand, accumulated deficits on a current account deficit and capital transfers increase foreign ownership of a debtor country’s economy, making the current account itself more difficult to manage. Capital inflow (NFCA) increases the money supply M3 in the receiving (creditor) country, increasing systemic inflation Ms there, and vice versa for a debtor country. There are no “ifs” or “buts” about this. The only practical way for debtor countries to overcome this problem is to reverse foreign debt growth using an effective tool such as a Foreign Transaction Surcharge (FTS) proposed by the author to manage capital flows. [ For more information see Using a foreign transactions surcharge (FTS) to manage the exchange rate.] It cannot be done by monetising the foreign debt because while doing that might lower the exchange rate it also inflates domestic costs, negating the benefit of the lower exchange rate. Current accounts also dominate the domestic interest rate structure in debtor countries because foreign investors have to be encouraged to buy and own the debtor country’s assets. The debtor country has to “compete” with the rest of the world to attract that investment by offering relatively high financial returns. Since the domestic systemic inflation Ms is the net interest paid on the Domestic Credit (plus the net interest on Nb), domestic inflation cannot be properly managed in the presence of substantial interest-bearing foreign debt. Many economists will claim New Zealand has been off-setting assets abroad. That is true, but the author’s view is that aggregate foreign ownership of New Zealand production is still the same as foreign control of those assets. In New Zealand, NFCA is negative and is assumed to be funded directly through the current account. That makes “free trade” proposals like the Trans Pacific Partnership Agreement (presently being negotiated in secret) suicidal for the domestic economy of debtor countries unless they provide for effective control of capital flows in the national interest. Domestic Credit (DC) and secondary debt (Nb) must typically be funded from the productive economy. In this paper, New Zealand’s foreign debt (ownership) is assumed to be directly funded through the current account deficit. Some economists like Preston in New Zealand believe nearly all the costs of foreign debt are included in the current account and that appears to be true from equations (1) to (9). Even so, funding growing accumulated current account debt is still similar to charging up an international credit card. Debtor countries like New Zealand are forced to sell off more of their capital assets each year to pay for the repatriation of current profit and interest on existing foreign ownership there plus any incremental increase in new current account debt driven by consumer and other demand. Domestically, cost-push inflation is systemic and is the net deposit interest Ms shown as Model Systemic Inflation in Figure 3. In New Zealand, the average interest (bank funding rate) is published monthly by the Central Bank. In New Zealand the figures are given in the Reserve Bank of New Zealand Table C10. The current historical series runs from Dec 2004, but other more general previously published official data can also be used. The costs of foreign bank funding (presently about 23% of total funding) and hedging costs are not included in the Table C10 figures. Those additional costs are assumed for simplicity to be capitalised in the current account figures. For modelling purposes, interest paid to non-bank secondary lenders Nb and the notional return on the bank Residual R are assumed to have a 2% margin over the M3 bank rates. The main methodological issue in calculating Ms is working out the net tax payments on the interest because the tax represents a transfer payment to the government and so remains in the productive economy. The effective tax rate on those receiving deposit interest is the average tax rate paid over all the tax-payer’s income, not the top marginal tax rate applied to that tax-payer’s income. Accurate estimation of the net aggregate deposit interest lies beyond the scope of this paper and is subject to further research. The NZ Department of Inland Revenue can provide data on the tax paid on each income band and the numbers of people in each band. An accurate assessment of tax may therefore be possible but it is complex. In practice, it may be better to create new reporting and data series to accurately calibrate the debt model deposit interest. The model is fairly sensitive to the tax rate, so Figure 3 is preliminary pending further work on the tax deductions on gross deposit interest. Managing productive sector inflation depends on eliminating deposit interest as far as possible. That is why measured CPI inflation is very low in countries like Japan, Germany and the US where deposit interest rates are almost zero. However, there could still be demand-pull inflation from residual foreign account imbalances and any positive bubble debt Db should deposits be diverted from the investment sector to productive transaction accounts. It would take only a very small leakage from the investment sector to the productive sector to create demand-pull inflation in the productive economy. The debt model says that cost-push inflation on the other hand is purely a systemic monetary matter. Systemic inflation is not the same as CPI inflation but it is much more relevant to macroeconomics than CPI inflation is. Systemic inflation is the monetary input mathematically needed to fund the financial system itself. CPI inflation is typically much less than systemic inflation because orthodox monetary mismanagement restricts disposable incomes (and therefore CPI inflation) below the productive potential of the economy. Recession occurs in the debt model when the nominal GDP increase falls below systemic inflation whereas in orthodox economics a recession occurs when the GDP increase falls below the measured CPI. Deposit interest rates used to calculate systemic inflation are from Reserve Bank of New Zealand table C10 funding rate. 2% extra has been added to that for interest on R and NBLI. GDP could be managed by changing the financial system to minimise systemic inflation by reducing interest rates toward zero, and by managing the money supply to fully utilise the physical economic resources available to the economy, greatly reducing CPI inflation. Since the debt model requires exponential debt growth, Ms is also an exponential function. Figure 4 shows that the accumulated inflation-free GDP component has been shrinking as a proportion of GDP in New Zealand since inflation targeting was introduced there in 1988 and banking has become more automated, while the proportion of Ms in the GDP has been increasing. Figure 4 suggests Dni has all-but disappeared in New Zealand even though that may be counterintuitive. Errors in the model calibration affect the relationship between Ms and GDP but they do not affect the trend. The likely result in New Zealand is debt default and destruction of GDP as is already happening in some parts of Europe . Figure 4 is calculated on the assumption NFCA (negative for NZ) is funded directly through the current account. Figure 4 shows why real incomes in many developed economies have been stagnant or falling in recent decades. As shown later on (using the Fisher equation of exchange), the real impact of systemic inflation is being masked by the suppression of incomes. There has been no aggregate real growth in New Zealand for 30 years. Zero Deposit Interest is Impossible in a Capitalist System. GDP in the debt model is the net outstanding principal on productive capital investment (fixed capital formation). The reason this is so is set out in the author’s paper the DNA of the debt-based economy. In the capitalist system there must be debt to enable the purchase and exchange of capital goods. In a reformed financial system based on debt-free money, the money to purchase and exchange capital goods is borrowed from deposit holders at interest on a Savings and Loan (S&L) basis instead of from commercial banks. Consequently, there must be an “incentive to save”, otherwise there will be leakage from investment sector to the productive sector causing very high demand-pull inflation in the productive sector. In fact, all the main monetary reform proposals such as the Chicago Plan (CPRII), the Manning plan for permanent debt reduction in the national economy, the Positive Money proposal in the UK, and the AMI proposal in the US feature S&L lending. When deposit interest rates are close to zero, demand-pull inflation is limited only when savers choose to hoard for a rainy day despite receiving little or no deposit interest (as was typical in pre-industrial times), or where they choose to invest in dividend-bearing investments or in direct productive investment for profit. This is commonly called the “opportunity cost” of capital. A major difference between the modern economy and that in pre-industrial times is that the relative amount of “saved” money in the investment sector is proportionately much greater now than it used to be. With low interest rates and systemic inflation there would be little property speculation because there would be little aggregate capital gain. Instead, the investment property market would be governed by the net return on investment such as, for example, net rental income. MEASUREMENT OF GROSS DOMESTIC PRODUCT (GDP). Suppose Vy = 10, My=100, Q= 1000/year and P=1. At constant price and speed of circulation, producing 20% more goods requires 20% more money, that is, wages and incomes. Changes in productive transaction account money My and output Q are always and necessarily proportional when P and Vy are constant. The Fisher equation presented here is a macro-economic snapshot at a point in time. At the end of the year the goods in the example are being produced at the rate of 1200/year when the productive transaction account money supply is 131 (instead of 120) and prices are 10% higher than the previous year. However, the situation over any period is dynamic, not static. All the variables are increasing over time so they have to be “averaged” over the period in question when using the annual output measure of GDP. The real annual GDP is therefore 1155, (1100*1.05), produced at an average price of 105 using an average productive transaction account money supply of 115.5. In that case, the nominal GDP increase is 155, (1155- the production rate at the start of the year, 1000) or 15.5%. In the present system of national accounts (SNA) the “inflation” of 10% of 1000, (100), would be deducted from the nominal GDP growth, (155), leaving just 55 as measured “real growth” instead of (in the example) 155- 50, (5% of 1000), or 105. In current practice, the aggregate GDP measured over time represents the 1155 in the example while the CPI price increase used in the national accounts is the gross price inflation of 10% at the end of the year instead of the “average” price increase of 5% shown in the example. Inflation is half of what orthodox economics says it is, while, (in the example), economic “growth” is nearly double what orthodox economics says it is. A CPI consumer price inflation rate of 2% over time represents a1% inflation in the aggregate value of goods and services produced during that time, not 2% as is universally assumed. The standard practice of subtracting a percentage rate of CPI inflation from the nominal growth in the value of GDP output over any given period is therefore incorrect. Prices P remain the same but there is a 36% increase in incomes (42/115.5) and a 36% increase (400/1100). There is no reason why economic output cannot be increased to make use of all the available economic resources without causing systemic inflation as long as deposit interest is close to zero and the money supply increases in proportion to output. Austerity policies around the world have failed so dismally because they have arbitrarily suppressed aggregate incomes, leading to the decay of accumulated non-inflationary growth shown in Figure 4. True productivity increases, which are not typically accompanied by an increase in the money supply, can worsen the measured economic output because they reduce prices. They are deflationary. Inflation, on the other hand, increases prices P and the money supply M, not the amount of goods Q. There can be no increase in Q unless there is more production. If the given total work hours and productivity remain the same, Q must be the same whatever the price level may be. For Q to increase there must be either more work hours or plant (more labour or capital) and/or an increase in productivity (more goods and services produced with the same number of work hours and capital input). Suppose now the population increases by 10% at constant work hours per person and there is also a 10% rise in productivity. While increases in monetised production are nominally isolated by measuring GDP output and prices P, as previously discussed, real productivity increases are not automatically measured in official output statistics because they are usually masked by price reductions. In the case of the 10% productivity increase on its own in the above example, the price level is 9.1% lower [(1-0.909)*100]. When the increased productivity is combined with the concurrent increase in monetised production due to the 10% population increase, the price level P is still 8.3% lower [(1-0.917)*100] than it was before the two increases occurred. 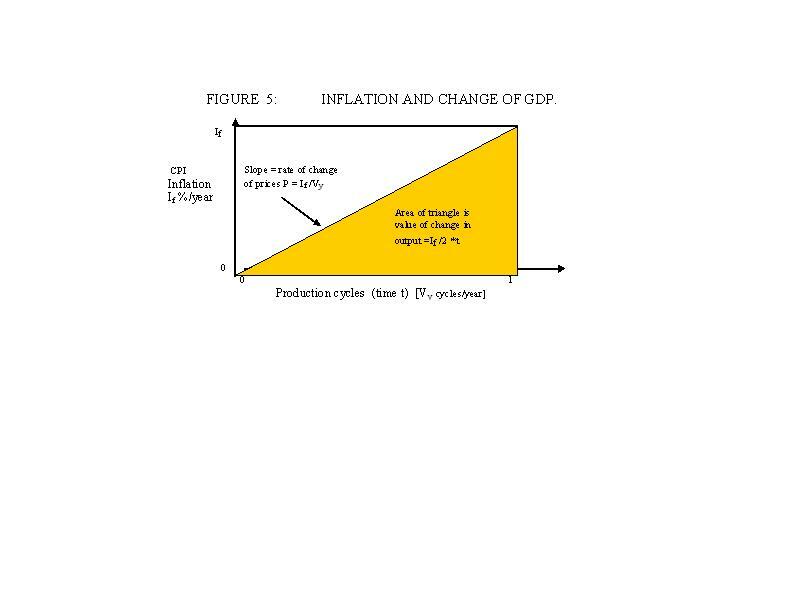 To maintain prices P=1.00 with a productivity increase of 10% and a concurrent population increase of 10% the money supply would have to be increased from 110 to 120 as shown below. Orthodox measurements of GDP and “productivity” fail to reflect real increases in productivity contributions to output Q. They also miscalculate the measured monetised growth, as previously discussed. GDP measures the combined PQ side of the original Fisher equation while disregarding the MV side of the equation. Using half the Fisher equation for measurement purposes is mathematically insupportable. Orthodox methodology determines the price level P by surveys of consumer prices that are then weighted to produce a hypothetical average consumer price called the Consumer Price Index (CPI), which is then used to indicate the price level P contributing to the GDP (PQ). In orthodox economics and the system of national accounts (SNA), productivity is typically measured as the increase of total output PQ for each unit of input (capital and labour), not the increase of production Q itself, even though the physical increase in production in many sectors is known and could be used as the basis for accurate measurement. For example, the primary industries, manufacturing, tourism, but not, in general, service industries and government, despite attempts to measure quantitative outputs. The definition and methodology of “productivity” measurement can be found for New Zealand at the www.stats.govt.nz website. This fatal mistake dramatically affects the entire system of national accounts and the measurement of economic success in the world economy. If measured “productivity” PQ/hour rises by 2% and measured price inflation P is, say, 2%, the effect of that inflation in P of 2% has to be deducted from the real productivity increase discussed above. The calculation below shows there would then be an “inflation- free” productivity increase in Q of 0% instead of 2%. Using the Fisher Equation, the 2% measured “productivity” increase in the rate of output PQ is really made up of 2% inflation and 0% productivity gain. Defining productivity increases in PQ/hour does not necessarily create real increases in output Q. Assuming they do so automatically is nothing less than wish fulfilment. The whole concept of improving productivity is increasing Q/unit input (labour and capital), not the total output PQ. In practice, CPI inflation in New Zealand has often been higher than the “official” increase in PQ/hour. As shown in the example below, an inflation rate of 2% and a “measured” increase of 1% in PQ productivity gives a decline in the rate of production Q of 1%! Moreover, the money supply is also being squeezed. The measured “productivity” increase in the example below is a myth. Aggregate changes in production Q can be assessed when output PQ and the price level P are both known, but productivity changes can only be assessed using both sides of the Fisher Equation of exchange. The relationship between the author’s debt model, inflation and GDP. As set out in the author’s papers referred to in this article, the payment of interest on debt in the debt-based financial system creates systemic inflation that forces up the productive transaction account money supply My. In the debt system, if My did not rise, the financial system would collapse because incomes in the productive sector are continually being transferred from income earners to deposit holders. The immediate effect is to reduce the purchasing power of income earners so they literally cannot buy the goods and services they have produced. Hypothetically, deposit holders (“savers”) could buy the excess goods and services but that doesn’t happen because of the “incentive to save” referred to earlier in the article and because “savers” alone cannot physically absorb the surplus. Instead, in aggregate, households and businesses are forced to take on the new Ms debt, which is the systemic inflation arising from net after tax deposit interest paid on the Domestic Credit (DC) plus interest paid on secondary debt NBLI, (Nb). The additional servicing of that additional debt load Ms is a primary cause of increasing income inequality around the world. In practice, if Ms in the debt model (equation 3) increases at 4%/year the money supply My in the productive transaction accounts must also increase by at least 4% assuming speed of circulation Vy and price level P remain constant as shown in the examples above. In the special case of equation (9), if Ms did not grow, nominal GDP growth would be largely determined by the monetised value of non-inflationary growth Dni. For the change in Ms to be zero, deposit interest rates must also be zero. Since, as already explained above, that is not possible, there will always be some increase in Ms and therefore some systemic inflation. That applies whether the financial system is based on bank debt or on Savings and Loan (S&L) debt. The main difference between bank debt and S&L debt is that in the latter case the bank Residual (R) does not grow as quickly. The innermost secret of the debt-based capitalist system is laid bare for all to see. The net unearned interest income Ms is a fundamental baseline of nominal GDP growth as shown on Figure 2. Adding less than Ms to the credit aggregate DCm must contract the measured economy. Excess non-productive debt produces excess deposits that typically increase M3 and systemic inflation as well as inflating non-productive investment sector prices. As shown above, additional debt-free cash-based purchasing power introduced to the productive system over and above systemic inflation produces real growth as long as there are sufficient available human, natural and physical resources available to the productive economy. That growth is generated by more hours worked, such as by increases in the working population, reduction in unemployment, and longer working hours, while the additional contribution of improved productivity can be best measured by physically measuring the physical quantity of Q/hour, not PQ/hour. Within the framework of a capitalist system any monetary reform proposal must introduce more money into the system (even if it is introduced debt-free) before monetised “growth” as it is currently measured can occur and, in the relative absence of traditional bank loans, most of that new money must be on-loaned at interest through S&L interest-bearing accounts to fund the investment sector. In the various monetary reform proposals the interest paid on the S&L accounts will still generate an exponential growth in Ms and some systemic inflation. Both could, in theory, turn out to be greater than they are today unless they are carefully managed. It is impossible to “produce” a higher GDP (PQ). It is only possible to produce more (or fewer) goods and services Q. Too much new money Mv will create inflation. Too little money will induce systemic collapse. The balance in the productive sector is sensitive because the dynamic productive transaction account balance Mv is just a few percent of GDP. My presently circulates (at least in New Zealand) about 18 times a year, down from an estimated 28 times a year in 1978. The debt model (equation (3), Figure 2) provides an extremely simple way to match systemic inflation and non-inflationary growth with extra output enabling GDP to be increased at near-constant prices. The difference between systemic inflation and measured CPI inflation in the present financial system reflects on-going suppression of wages and incomes. Governments have suppressed economic “growth” because inappropriate orthodox inflation targeting in the presence of systemic inflation Ms has meant that incomes have been unable to grow fast enough to absorb existing output let alone increased potential output. With the single exception of 1995, systemic inflation in New Zealand has been consistently much higher than the measured percentage CPI ever since the 1987 share market crash that prompted the introduction of inflation targeting. 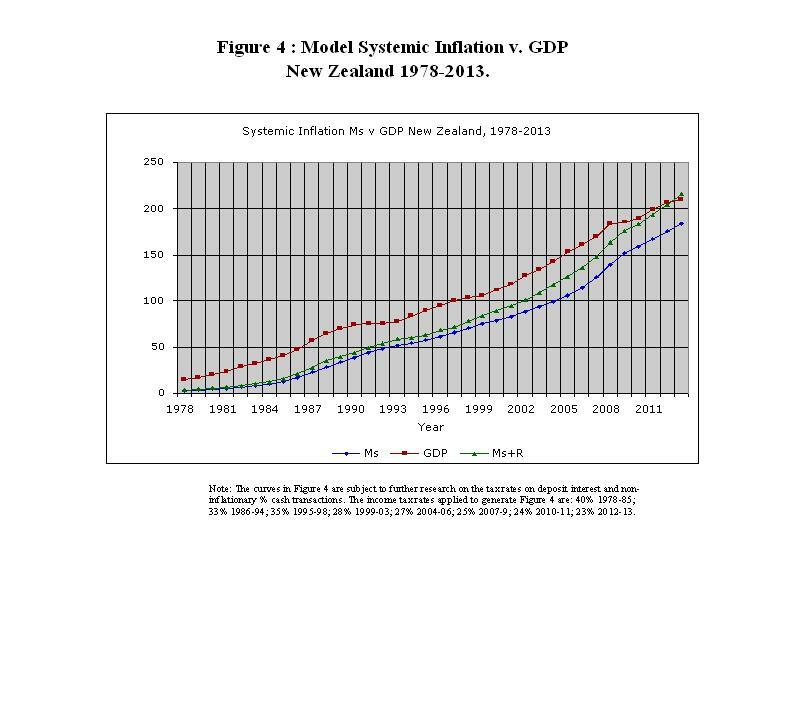 The improper use of inflation targeting accompanied by ideologically driven austerity policies have literally crushed the New Zealand economy as they have crushed the economies of other nations worldwide. That is why the real purchasing power of the incomes of ordinary people, the “99%”, has been static or declining throughout much of the industrialised world for decades. 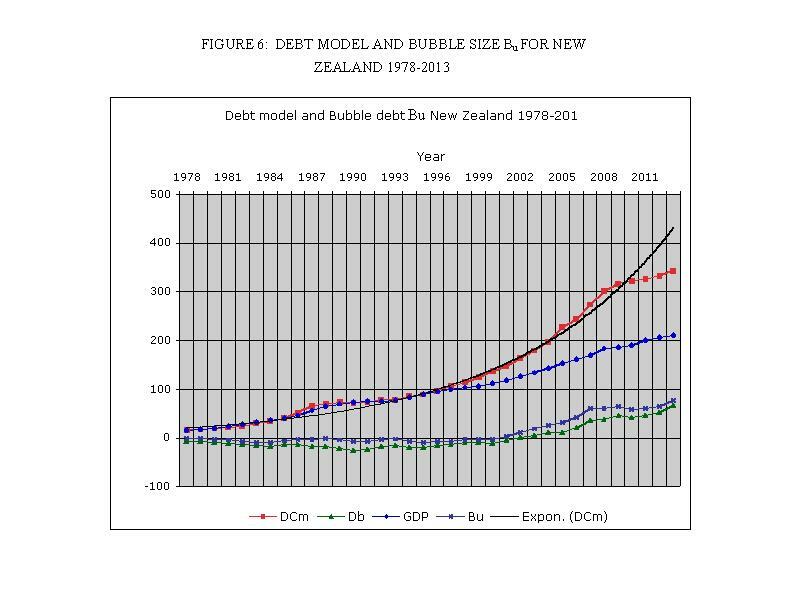 Figure 6 shows the debt model (Figure 2) solved to obtain a preliminary estimate of the bubble debt Db in equation (5) for New Zealand. It does this by comparing the official money supply M3 with the terms on the right hand side of equation (5) shown below. Figure 6 shows that orthodox monetary policy bears little relationship to the mechanics of the debt-based economy. The non-bank debt Nb has to be added to the bubble debt Db to get the bubble value Bu in Figure 6 because Figure 6 is based on the total debt DCm whereas Db is derived from the equation for DC. There are discernable (quantifiable) bubbles relative to the trend curve of Bu in New Zealand prior to March 1988 and prior to March 2009 as well as other “business cycles”. On the basis of the preliminary analysis in Figure 6 the 2009 bubble Bu does not appear to have unwound and M3 growth is out of control. That means the Reserve Bank of New Zealand is right to be concerned about rising prices in the investment sector in New Zealand because they too appear to be out of control. The exponential rise in systemic inflation Ms is inexorable. It is unlikely that the 2005-2009 debt bubble in New Zealand can be unwound using orthodox economic theory and policy tools. The bubble debt has been calculated from equation (5) as Db= M3-(Dmy + Ms+Dni). The separation of (Dni + Db) into Dni and Db needs further research. For Figure 6 it has been obtained as the difference between the measured nominal GDP increase and the change in (Ms+R). R = Bank residual captured from GDP. 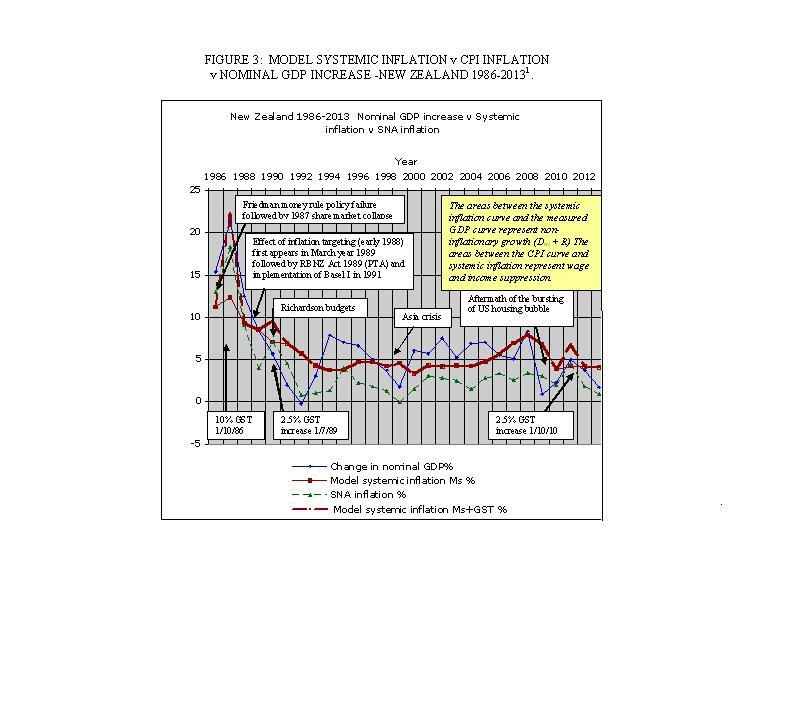 Figures 4 and 6 indicate that unless the exponential growth of the model systemic inflation (Ms) is halted, the New Zealand economy could be heading towards collapse similar to that being experienced in some parts of Europe. This paper hints that the New Zealand economy and the economies of other industrialised countries have deep-seated structural problems. Exponential debt-growth and productive sector inflation are synonymous with capitalism. This point is discussed at length in the author’s paper Capital is Debt. Governments and economic policy makers have striven to make square policy pegs fit round economic holes subjecting the world and its people to boom and bust cycles with immeasurable consequences. This paper suggests that sound monetary management can produce dramatically better economic outcomes worldwide. To do so will mean abandoning the myths about inflation, growth, and monetary mechanics that underpin orthodox macroeconomic policy and at the same time fail to satisfy the basic accounting equation. - strictly managing cross border capital flows using powerful tools such as a Foreign Transactions Surcharge. - using the revised Fisher equation of exchange (equation (3) outlined in this paper (or similar) to enable the money supply to be properly aligned with potential economic output. - introducing broad monetary reform such as the Manning Plan (or similar) to keep interest rates as close to zero as possible. - constraining secondary debt growth as the use of interest-bearing bank debt is phased out in the course of implementing monetary reform proposals. - ensuring that the macroeconomic model chosen satisfies the basic accounting equation at all times. - abandoning the methodological fallacies in the calculation and use of the CPI inflation index and GDP calculations. - introducing a valid methodology to measure and account for true increases in productivity and/or production. Bubbles occur in the investment sector due to uncontrolled debt growth Db while, at the same time, the productive sector is suppressed through arbitrary orthodox macroeconomic policy settings. The debt bubbles have occurred because of fundamental misconceptions about the way the financial system works. Comments on the IMF (Benes and Kumhof) paper “The Chicago Plan Revisited”.